Transaction management is about making sure that when database operations change data, they do not cause problems. Isolation: Transactions are written as if they are the only program executing in the database (in isolation from any other program). Their effects should reflect that. Duration: Once a transaction is successfully completed, its effects should be recorded on disk and never be lost. In this lecture, we will concentrate on the “isolation” component assuming atomicity and consistency are ensured. Making sure isolation is satisfied means that concurrent transactions cannot erase each others data. To study concurrency, we will abstract how we view transactions. The only operations that matter in a transaction are the data items the transaction reads or writes. This transaction reads two data items and writes only one. Multiple transactions may execute concurrently and their operations may interleave. The sequence of operations that take place in the DMBS is called a schedule. This schedule shows a partial execution of T1 and T2. Unless we see a commit or abort, we assume that T1 or T2 are not yet finished. The ordering of the operations is likely determined by many things: which operation gets executed first and which operation is delayed due to concurrency control. Given each transaction is supposed to be a correct piece of code if executed completely, then any ordering of transactions is acceptable. A serial schedule is one in which one transaction executes at a time. Any serial schedule is an acceptable schedule. Any schedule that is guaranteed to produce the same result as a serial schedule is an acceptable schedule. How do we know two schedules have the same result? Two schedules are guaranteed to have same results if they will read the same values and write the values in the same order. S1 and S2 are equivalent: T2 reads X before T1 writes it. S1 and S3 are not necessarily the same. In S3, T2 reads X after T1 writes, so the value read may be different. on the same item (e.g. X) by two different transactions (e.g. i and j) and at least one of the operations is a Write. In each case, if two schedules switch the ordering of any of these operations, the result will not be the same. In this case, the value read by r1 may be different. In this case, the last value written is changed and may not be the same. If two schedules S1 and S2 have the same ordering for all conflicting operations, then they will have the same result. Such schedules are called conflict equivalent. Conflict equivalent schedules will always have the same result. If a schedule S1 is (conflict) equivalent to a serial schedule S, then we say that S1 is serializable. To find whether a given schedule is serializable, we need to draw the conflict graph. Each transaction in the schedule is represented by a vertex. 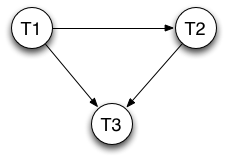 we draw a directed line from node for transaction Ti to transaction Tj. This means that in all serial schedules equivalent to this schedule, Ti must come before Tj. If the underlying conflict graph for a schedule has a cycle, then the schedule is not serializable. Find a node with no incoming edges, add to the serial order and remove from the graph until no nodes are left. This graph has no cycles and is therefore serializable. Node T1 has no incoming edges, so it must come first. After we remove T1, node T2 has no incoming edges, so it must come second. The final serial order is: T1, T2, T3. As this graph has cycles, this schedule is not serializable. We want to make sure that the transaction management system only produces serializable schedules. This is the main principle behind concurrency control. Concurrency control is a series of protocols implemented to ensure the resulting schedules are serializable. Check before each transaction operation to see if it will lead to a potentially bad schedule. If the operation can cause trouble, stop the operation and suspend the transaction until it can continue. Often accomplished using locks (see below). Let all transactions execute freely, but check before they commit if they may lead to a bad schedule. If so, abort the transaction and undo any changes it made. Often accomplished using state information (multi-version concurrency control used in Postgresql using timestamps). We will see the lock mechanism in detail. We will discuss the multi-version control very briefly afterwards. The transaction management system will put the transaction on hold and monitor the lock it needs. As soon as the locked item is unlocked, the first transaction waiting for that lock is granted the lock and allowed to continue. One possible execution with locks. Locking alone does not guarantee serializable schedules. We need a protocol to tell how long to keep locks. Two phase locking and strict two phase locking are two such protocols. All transactions must get a lock for each item that they need to access. Growing phase: If a transaction is in this phase, it can only get new locks. Shrinking phase: If a transaction is in this phase, it can only release locks. As soon as a transaction releases one lock, it enters the shrinking phase. After this point, it cannot get any new locks. Schedules generatd by two phase locking (2PL) are always serializable. We can prove this (informally) by considering the conflict graphs. We will prove that if a schedule is not serializable, we can show that there is no way to generate such a schedule using 2PL. This is not a formal proof, but a simple sketch to show the logic. We will show that such a schedule S cannot exist. other to form a cycle. This schedule is not possible. allowed in 2PL. Hence, this schedule cannot happen under 2PL. We can show for all other potential schedules with a cycle, they cannot happen under 2PL because this would require a transaction to get a lock that they did not have after they have entered their shrinking phase, which is not allowed under 2PL. Give each transaction a unique and increasing timestamp when it starts. Wait and die: if an older transaction requests a lock held by a younger transaction then wait, otherwise abort. Wound and wait: if an older transaction requests a lock held by a younger transaction then abort the younger transaction. If a transaction waits too long, then time out and abort the transaction. Many transactions can read the same item, but only one transaction can write an item and hold an X lock on that item. If item A has no locks, whoever asks for an S or X lock can get it. If item A has an S lock by some transaction, only S locks on this item are granted to other transactions. The two phase locking protocol remains the same. The transactions must request the appropriate lock and release it eventually. Now T1 and T2 are both waiting for the other one to release the S lock on X, which will not happen as both are suspended. We can introduce a new type of lock to address the problem caused by lock upgrades. An update lock can be granted to one transaction only. The transaction holding an update lock can later upgrade it to exclusive. A transaction must request an update lock before it tries to upgrade its lock from S to X. If a transaction holds an update lock, no other transaction may get a new lock on that item. Update lock works like a shared lock, but it cannot be shared with another update lock. The locking scheduler examines the actions of the transaction and inserts the appropriate lock request before the actions. Transactions do not release locks. The scheduler releases the locks when the transaction commits or aborts. a linked list of transactions waiting for that lock. When a lock is released, the scheduler decides which transaction waiting for that lock should get it. Priority to upgrading: first grant updates, then use one of the other protocols. Under 2PL, when a transaction is about to commit, it cannot possibly lead to an unserializable schedule. So, commits are granted. If the transaction is holding any locks, they are released. Strict two phase locking is a more restrictive version of 2PL. A transaction requests locks that it needs before accessing an item. If the lock is not available, the transaction will wait until the lock is granted. When the transaction commits, all locks it is holding are released. Under Strict 2PL, there is no shrinking phase. As Strict 2PL is even more restrictive than 2PL, it also guarantees serializability. However, it allows for less concurrency as it holds locks longer. Lesson: if a lock is not needed, it is better to release it as early as possible. As long as 2PL is satisfied, there is no problem. Instead of only S/X locks, we can use a multi-level lock hierarchy. SIX: Intension to read some nodes and change some nodes in the lower level. When a new transaction comes, it needs to declare intention on the top. If the intention is compatible, it can continue to the lower level. Reading the whole index (index scan) requires a full S lock on the index. Not compatible with X, IX or SIX. 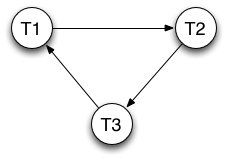 Changing only a single node (inserting a new tuple) requires IX lock in the upper level. Only the leaf node being changed is locked with X. Another transaction with IX or IS can also access the same upper level node, just not the leaf node. Often transactions will not access the same information. Read is never blocked and all reads are for committed values. If a transaction T wants to write data X, but a transaction with a later transaction timestamp has changed it, then T will be aborted. Because X may have changes that T did not yet see (as it is using an earlier timestamp). Concurrency control is about making sure that concurrent transactions do not access or modify the same data in a problematic way. The golden standard is serializability: make sure that a schedule generated by a concurrency control mechanism is guaranteed to produce the same result as a serial schedule: one that executes a single transaction at a time. Though the ordering of transactions in a serial order is not important, any order is acceptable. Two check serializability, we only need to ensure that conflicting operations by different transaction can occur in the same order in a serial schedule. We can do this by constructing the conflict graph and checking if there are cycles. Two main methods of concurrency control are often used. Lock based systems (such as in two phase locking) try to prevent bad schedules from happening by checking each action (read/write) for transactions before they occur. Multi-version control systems are less restrictive, allow reads and are restrictive for writes. May require transactions to be aborted and restarted if there are a lot of conflicting operations. © Copyright 2016, Sibel Adali.